Modern Beauty Girl: Stylish Summer Week 3 Schedule! You guys are KILLIN IT! 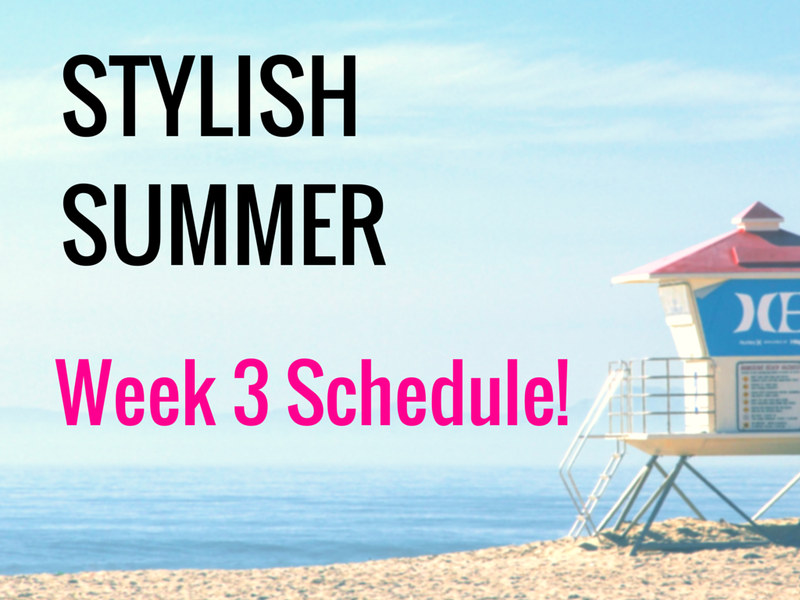 I love seeing all of your posts on social media under #StylishSummer, and you are killing these daily challenges! This week is pure fun! You're gonna try some new things, dream big, and to top it off, there's a giveaway this week! I already announced the giveaway in a previous post, but you can enter by clicking right here! Every monday so far we've been listing it out! This week's no different! Share your bucket list with me on social media using #StylishSummer and check my facebook and twitter because I'll be posting mines as well! Your workout move comes out today! Click here to watch it! We're doing ABS this week and I'm sharing some v-up variations with you! You've been staying active lately and I LOVE IT! Today, challenge yourself even more by going all out! Run longer or harder than you usually do, use heavier weights, spice it up and push yourself harder than usual! You can do it! I love juicing as a way to sneak in some of those fruits and vegetables! I've done a post with my favorite juice and smoothie recipes before, which you can see here! Instagram your juice and tag me @miss_sienna so I can see it! Thursday: Bring Out 'dem Wedges! I am obsessed with wedges (especially straw wedges) during the Summer, and today we're going to bring them out! Put on a nice pair for work, or throw on a sassy one for a nice night out! Celebrating cuz I finally got cleared! Everyone said recovery after shoulder surgery takes 4-6 months, but I got done in 3! Colored eyeliner is one of my favorite things EVER! You can totally go natural with a navy blue or a deep eggplant, or you can go bold with a mint green or electric blue! Have fun, and step out of your comfort zone! If you need some inspiration, I shared a one of my favorite ways to wear colored eyeliner here! You guys are all so amazing, and I am so incredibly proud of you! Also, the giveaway winner will be announced next monday in a blog post! If you haven't joined the challenge yet, it's not too late! Join now because there will be 3 more giveaways for all you Stylish Summer members!